Claudia Dubreuil, born in 1887, became Madame Meilland when she married Antoine Meilland. She died in 1932 at the comparatively early age of 45. Six generations of Meillands have been rose growers. They are still the most famous rose growing family in France, and the family firm produces some 12 million rose plants a year. A rose bred by Madame Meilland’s son François was poised for introduction internationally when the Second World War broke out so introduction was limited initially to France. He named the rose ‘Madame A. Meilland’ in loving memory of his mother and is it still known by that name in France today. However it was renamed in the USA to commemorate the ending of the war, and in the English-speaking world it is known as ‘Peace’. Under this and other names – in Germany it is known as ‘Gloria Dei’ while in Italy it’s called ‘Gioia’ – ‘Madame A. Meilland’ was to become the most famous rose the world has ever known. It has also provied a prolific parent, producing such famous offspring as ‘Chicago Peace’, ‘Kronenburg’, ‘Prima Ballerina’, ‘Royal Highness’ and many others. This is an excerpt from Peter Scott’s article in the Historic Rose Journal previously referenced. A little more about a rose that everyone knows. I’m prompted to look up the Wikipedia entry for this rose, to see if any reliable tidbits can be found there.. The Peace rose, correctly Rosa ‘Madame A. Meilland’, is a well-known and successful garden rose. Over one hundred million plants had been sold, as of 1992. It is a Hybrid Tea rose with large flowers of a light yellow to cream color, slightly flushed at the petal edges with crimson-pink. It is hardy and vigorous and relatively resistant to disease, making it popular in gardens as well as in the floral trade. It was developed by French horticulturist Francis Meilland in the years 1935 to 1939. When Meilland foresaw the German invasion of France he sent cuttings to friends in Italy, Turkey, Germany, and the United States to protect the new rose. It is said, that it was sent to the US on the last plane available before the German invasion, where it was safely propagated by the Conard Pyle Co. during the war. As Meilland sent his cuttings just before the war, communication between the cultivators was not possible, which is why the rose received different names. In France it was called ‘Madame A. Meilland’, in honour of the breeder’s mother. This is the formal cultivar name; all other names are selling names. In Italy it was called Gioia (It. for joy), in Germany Gloria Dei (lat. for glory of God) and in the USA, Peace. The rose became known as Peace in the following way. In early 1945 Meilland wrote to Field Marshal Alan Brooke (later Viscount Alanbrooke), the principal author of the master strategy that won the Second World War, to thank him for his key part in the liberation of France and to ask if Brooke would give his name to the rose. Brooke declined saying that, though he was honored to be asked, his name would soon be forgotten and a much better and more enduring name would be “Peace”. “We hope the ‘Peace’ rose will influence men’s thoughts for everlasting world peace“. 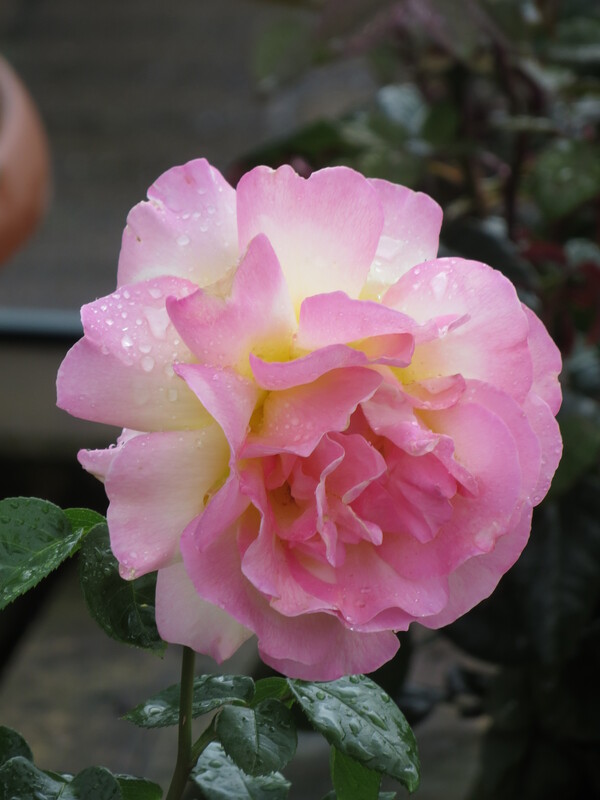 “‘Peace’, without doubt, is the finest Hybrid Tea ever raised and it will remain a standard variety forever”. Quite complete, I think then.